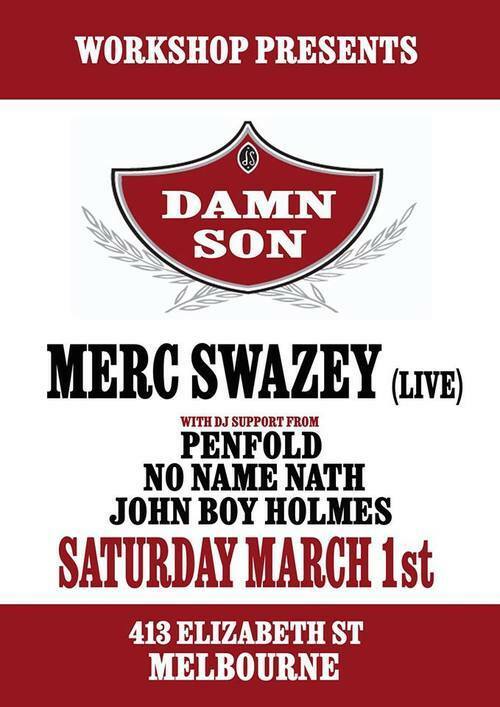 Get wavey to Merc Swazey this evening in Melbourne CBD’s Workshop, as part of the Damn Son trap nights. Kiwi Merc Swazey has been grabbing Australian hip-hop’s attention with his tongue-in-cheek trap style of MCing, and has also been slaying the Australian MC battle scene with humourous flair at such battles as 1outs. On a side note, it’s never escaped my attention that many diehard Australian hip-hop fans loath some MCs and DJs utilising American elements to their production and performance. Whilst they have a point on authenticity, have they ever considered the fact that hip-hop is actually an American cultural product? If you have this point of view in mind, what’s wrong with lending American elements in this artform? Anyway, rants aside. Other DJs playing trap styles are No Name Nath, DJ Penfold and John Holmes. Getcha bar handle fists up! Starts 8pm. Workshop, Level 1, 413 Elizabeth Street, Melbourne CBD. Free!